Home » What Happened to the Sunken City of Cuba? What Happened to the Sunken City of Cuba? Just over a decade ago, a team of explorers were working on an exploration and survey mission off the western coast of Cuba when their sonar equipment picked up a perplexing series of stone structures lying some 650 metres below the surface. The structures appeared completely analogous against the barren ‘desert’ of the ocean floor and seemed to show symmetrically organized stones reminiscent of an urban development. A media flurry soon ensued with news sites sporting headlines such as ‘Atlantis Discovered in Cuba’ and ‘Lost City of the Caribbean Found’. However, the finding also attracted the attention of the government, national museum, and national geographic, who all made promises to investigate the strange sonar images. Now, ten years on, the story has disappeared into obscurity. 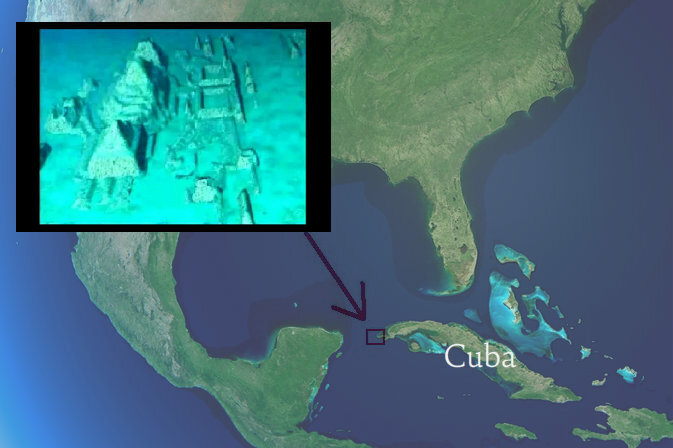 What ever happened to the sunken ‘ruins’ of Cuba? Were they ever fully investigated? And why has the media fallen silent on this unusual discovery? The discovery was first made in 2001 when Pauline Zalitzki, a marine engineer, and her husband Paul Weinzweig, owners of a Canadian company called Advanced Digital Communications (ADC), were working on a survey mission in conjunction with the Cuban government off the tip of the Guanahacabibes Peninsula in the Pinar del Río Province of Cuba. ADC was one of four firms working in a joint venture with President Fidel Castro’s government to explore Cuban waters, which hold hundreds of treasure-laden ships from the Spanish colonial era. The team was using advanced sonar equipment to scan a 2 square kilometre area of the sea floor when they noticed a series of symmetrical and geometric stone structures resembling an urban complex. Map showing location of supposed ancient city discovered by Paul Weinzweig and Pauline Zalitzki. Upon studying the sonar images, Zalitzki observed what appeared to be unusual formations of smooth blocks, crests, and geometric shapes. Some of the blocks looked like they were built in pyramid shapes, others were circular. In July 2001, they returned to the site with geologist Manuel Iturralde, senior researcher of Cuba’s Natural History Museum, this time equipped with a Remotely Operated Vehicle to examine and film the structures. The images revealed large blocks of stone resembling hewn granite, measuring about 8 feet by 10 feet. Some blocks appeared deliberately stacked atop one another, others appeared isolated from the rest. Zalitzki said that the images appeared to reflect the ruins of a submerged city but was reluctant to draw any conclusions without further evidence. In the media storm that followed the announcement of the discovery, news sites were quick to draw parallels with the fabled lost city of Atlantis. However, Zelitsky and Weinzweig were unwilling to make such comparisons. The story is myth, said Zelitsky. “What we have found is more likely remnants of a local culture,” once located on a 100-mile “land bridge” that joined Mexico’s Yucatan Peninsula with Cuba. Iturralde added that there are local legends of the Maya and native Yucatecos that tell of an island inhabited by their ancestors that vanished beneath the waves. Nevertheless, Iturralde does not discount the possibility that the rock formations are merely the result of the wonders of Mother Nature. “Nature is able to create some really unimaginable structures,” he said. Despite hundreds of media outlets reporting on sunken cities, advanced civilizations, the lost city of Atlantis, and submerged ruins, there are others who are not so willing to accept this point of view. Keith Fitzpatrick-Matthews from the debunking website Bad Archaeology, claimed that the depth of the alleged remains are the biggest problem for the sunken city proponents. During the Pleistocene, which was characterised by a series of ice ages, sea levels dropped significantly, but the maximum drop was around 100 metres. “At no point during the Ice Age would it have been above sea level unless, of course, the land on which they stand has sunk. This is the claim made for Atlantis: according to Plato’s account, it was destroyed “by violent earthquakes and floods”. However, if we take Plato at his word – as we must if we assume Atlantis to have been an historical place – the violence of its sinking makes it improbable that an entire city could have survived plunging more than 600 m into an abyss,” writes Fitzpatrick-Matthews. If we assume that he is right and that these stone structures do not reflect an ancient submerged city but are simply products of nature, then surely geologists and other scientists would be quick to jump on the finding and investigate what freakish event of nature caused such peculiar formations. Strangely, however, there have been no reported follow-up investigations and news outlets have gone deathly silent on the matter. What happened to all the promises from the government, national museum, National Geographic, and other scientists to carry out further surveys? The quick dismissal of the story has led some to question whether there has been a suppression of information regarding the finding. However, Fitzpatrick-Matthews claims the story simply went cold and that in the end experts were not convinced that Zelitsky had really discovered a sunken city. Reconstructed Image taken from the sonar scan of the sea floor off the coast of Cuba.